This is so much more than a simple traditional chordiera. By playing the Bouzouki in the conventional way with the forearm resting on the instrument’s soundboard the natural sound of the instrument is being dampened, resulting in reduced power, projection and tone. Please Note: The Bouzouki Prodigy Tailpiece/Armrest ‘Chordiera’ is designed to slide onto your existing ‘standard’ tailpiece Base Unit. 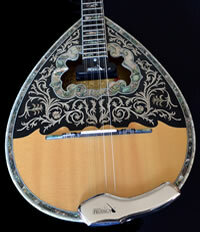 There are no alterations needed to be made to your Bouzouki. Your instrument will acquire 40% to 50% more EQ frequencies. Hear a slight increase in volume of the Bouzouki. The unique design will allow your instrument soundboard (KAPAKI ) to vibrate in the correct manner without muting it. Extremely comfortable to play on as it is ergonomically designed for your forearm to rest on. The soundboard (KAPAKI ) is protected from the long term damage caused by the arm rubbing on it and sweat penetrating the varnish and wood. A small rubber support pad underneath the tailpiece rests on the edge of the soundboard and does not interfere with sound. 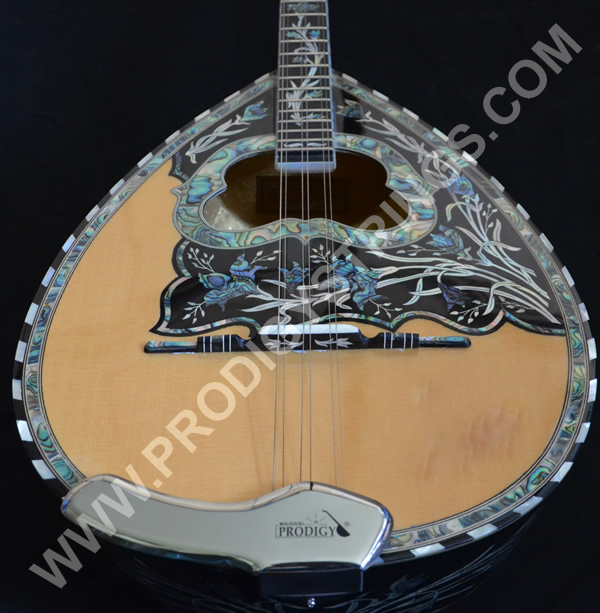 Looks very stylish and compliments the Bouzouki without detracting it from its natural traditional look. 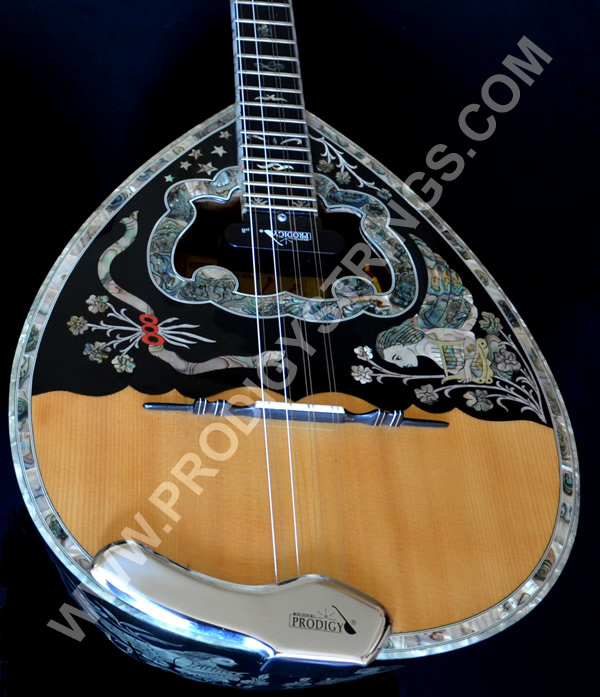 The bouzouki player will no longer be prone to bruising/marking on the inside of the lower arm as the forearm is supported on the smooth surface of the tailpiece/armrest and the highly polished metal allows free unrestricted movement of the arm as the player performs. This has 2 hooks up and 2 hooks down etc. 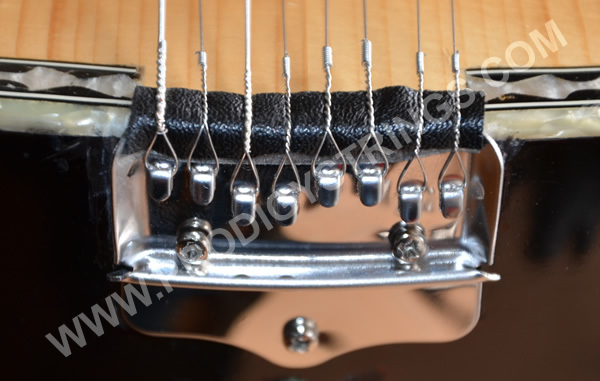 for easier installation of the strings. 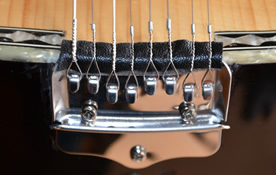 It also has a thin strip of Leather Faux across the top of the unit for the strings to rest on which eliminates metallic overtones that result when the conventional base unit is used. 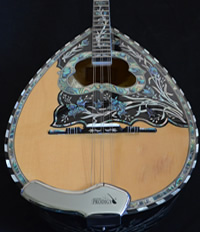 The Bouzouki Prodigy Base Unit is the same width as the conventional base unit but it is shorter in height so it no longer covers any floral designs that the bowl of the Bouzouki might have. 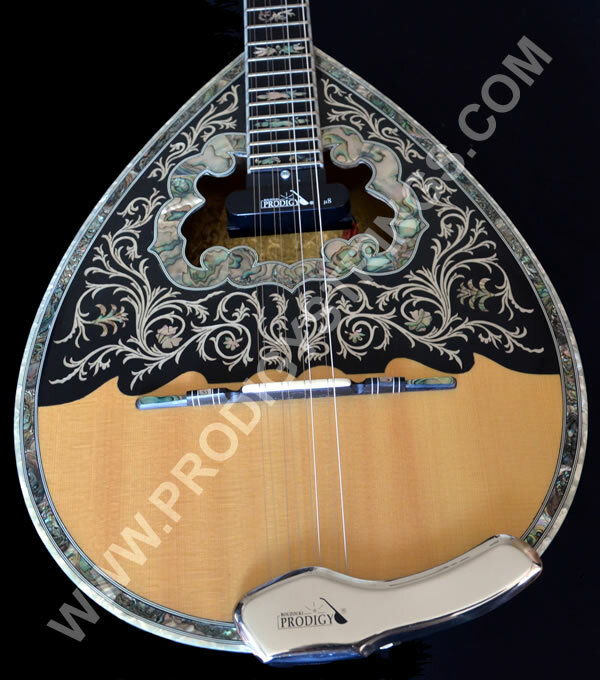 We are currently working on the Prodigy Tzoura 'Chordiera' Right & Left handed models. Our special thanks go to Chaz Dabat KKoshi for his valued studio use and sound expertise and also to the highly acclaimed Bouzouki player Pavlos Doukanaris ‘The Duke’ for his very valued assessments during the testing process of this new innovation.